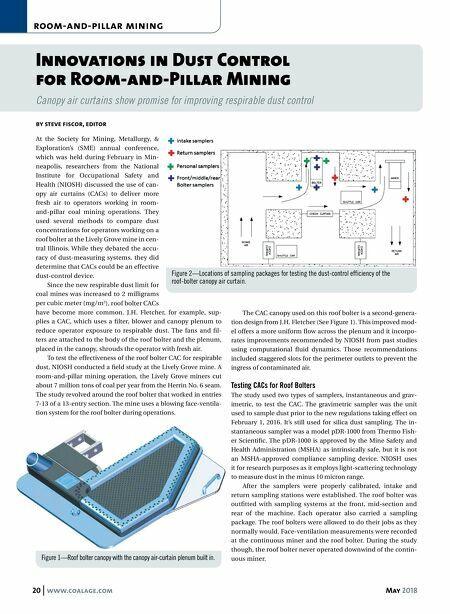 20 www.coalage.com May 2018 room-and-pillar mining Innovations in Dust Control for Room-and-Pillar Mining Canopy air curtains show promise for improving respirable dust control by steve fiscor, editor At the Society for Mining, Metallurgy, & Exploration's (SME) annual conference, which was held during February in Min- neapolis, researchers from the National Institute for Occupational Safety and Health (NIOSH) discussed the use of can- opy air curtains (CACs) to deliver more fresh air to operators working in room- and-pillar coal mining operations. 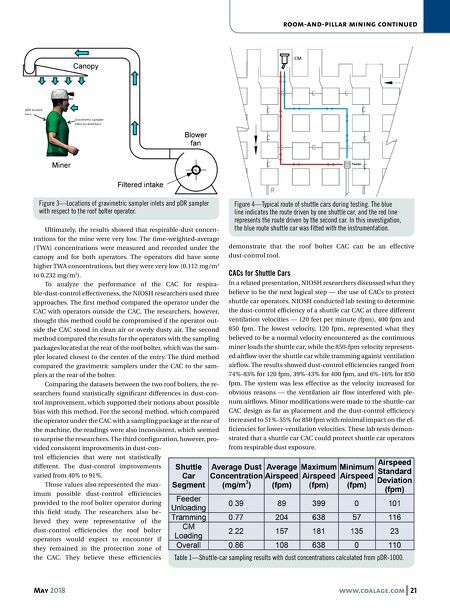 They used several methods to compare dust concentrations for operators working on a roof bolter at the Lively Grove mine in cen- tral Illinois. While they debated the accu- racy of dust-measuring systems, they did determine that CACs could be an effective dust-control device. Since the new respirable dust limit for coal mines was increased to 2 milligrams per cubic meter (mg/m 3 ), roof bolter CACs have become more common. J.H. Fletcher, for example, sup- plies a CAC, which uses a filter, blower and canopy plenum to reduce operator exposure to respirable dust. The fans and fil- ters are attached to the body of the roof bolter and the plenum, placed in the canopy, shrouds the operator with fresh air. To test the effectiveness of the roof bolter CAC for respirable dust, NIOSH conducted a field study at the Lively Grove mine. A room-and-pillar mining operation, the Lively Grove miners cut about 7 million tons of coal per year from the Herrin No. 6 seam. The study revolved around the roof bolter that worked in entries 7-13 of a 13-entry section. The mine uses a blowing face-ventila- tion system for the roof bolter during operations. The CAC canopy used on this roof bolter is a second-genera- tion design from J.H. Fletcher (See Figure 1). This improved mod- el offers a more uniform flow across the plenum and it incorpo- rates improvements recommended by NIOSH from past studies using computational fluid dynamics. Those recommendations included staggered slots for the perimeter outlets to prevent the ingress of contaminated air. Testing CACs for Roof Bolters The study used two types of samplers, instantaneous and grav- imetric, to test the CAC. The gravimetric sampler was the unit used to sample dust prior to the new regulations taking effect on February 1, 2016. It's still used for silica dust sampling. The in- stantaneous sampler was a model pDR-1000 from Thermo Fish- er Scientific. The pDR-1000 is approved by the Mine Safety and Health Administration (MSHA) as intrinsically safe, but it is not an MSHA-approved compliance sampling device. NIOSH uses it for research purposes as it employs light-scattering technology to measure dust in the minus 10 micron range. After the samplers were properly calibrated, intake and return sampling stations were established. The roof bolter was outfitted with sampling systems at the front, mid-section and rear of the machine. Each operator also carried a sampling package. The roof bolters were allowed to do their jobs as they normally would. Face-ventilation measurements were recorded at the continuous miner and the roof bolter. During the study though, the roof bolter never operated downwind of the contin- uous miner. Figure 1—Roof bolter canopy with the canopy air-curtain plenum built in. Figure 2—Locations of sampling packages for testing the dust-control efficiency of the roof-bolter canopy air curtain.